As we get the full announcements, I’ll update this page with the details (some additional coverage will take place on sansmirror.com for the mirrorless entries). Additional products I learn about will be found on a supplemental page. Panasonic announced the G80/G85 camera, the latest extension of their DSLR-like G lineup, pre-announced the GH5, plus provided information on three upcoming m4/3 lenses: 8-18mm f/2.8-4, 12-60mm f/2.8-4, and 50-200mm f/2.8-4. I deal with all these on sansmirror.com. 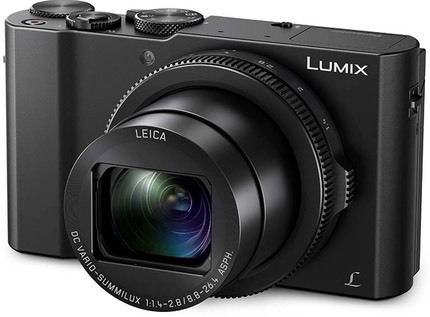 Also in Panasonic’s announcements were the LX10/15, a new compact 1” sensor camera, and the FZ2500. The LX10/15 has a 24-72mm (equivalent) f/1.4-2.8 Leica Vario-Summilux lens. Video is recorded at 2160P/30/25/24, or 1080P/60/50. The 4K video option uses digital zooming, not optical zooming; the camera itself has a 5-axis IS system. Still shooters can expect up to 6 fps with DFD focus active in continuous shooting. The LX10/15 does not have an EVF, though, using a 3” tilting touchscreen as the sole composition device. Overall, it seems a lot like the older Sony RX100 models (pre-EVF addition). Price US$699. The other announcement in the compact camera arena was the FZ2000/FZ2500, a 28-480mm (equivalent) f/2.8-4.5 DSLR-like camera with a 1” sensor that appears to be Panasonic’s answer to the most recent RX10 update. As with most Panasonic products, they’re promoting 4K video, in this case 10-bit 4:2:2 over the HDMI connection, though for some reason they keep insisting that if you want a Log-type photo style for video, you have to pay for it via upgrade (US$99 on top of the camera’s US$1199 price). Panasonic didn’t quite match Sony with lens (600mm f/4 versus 480mm f/4.5), but most of the rest of the specs tend to nod towards the Panasonic, though barely. Still, this new model is US$400 less than Sony’s, so I suspect it will do quite well. The surprise here is a full frame SLT A99II. This is essentially squeezing the A7rII sensor and electronics into an A77-sized body. The 42mp sensor is stabilized in the body to 4.5 stops CIPA. A new shutter is rated at 300k shots, which is good, because this camera is capable of 12 fps at full resolution. To deal with all this bandwidth, we have a new generation of BIONZ. As with other SLT designs, there’s a partial mirror in front of the image sensor to supply light to a dedicated phase detect system, in this case 79 dedicated cross AF focus points. 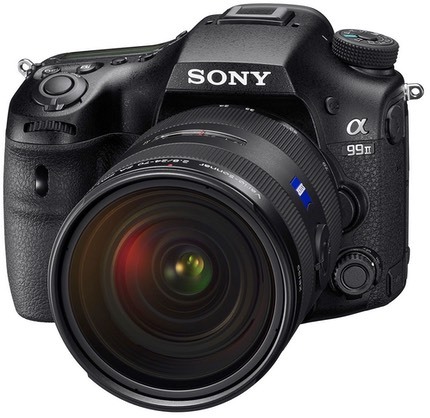 In addition, the A99II has focal plane phase detect, grouped as 399 additional focal points. Sony is also claiming a class leading -4EV for focus. Video is 4K from the full sensor and can output 8-bit 4:2:2 over the HDMI connection. There’s a 1.229m dot tilting LCD and the usual 2.36m dot EVF. Battery life still seems a problem, as Sony is quoting only 390 shots using the EVF per charger. The camera will ship in November for US$3200 body only. So Sony is back promoting the old Alpha mount, and with a body that is clearly targeted at high end enthusiasts. Overall it looks like quite an impressive camera. I’ve said all along that Nikon probably won’t be using the 42mp Sony sensor, and the A9II is a very good reason why: Nikon needs to find a better niche for the D810 followup than trying to fight with this new SLT, and that niche is likely “more pixels,” ala the Canon 5Ds/r models. Of course the Nikon DSLR crowd will be groaning again in lieu of camera announcements (let alone deliveries), and wondering what Nikon is (isn’t) doing. Regrouping, apparently. Still, if Nikon would just do as the high-end enthusiast and pro market really wants them to (that would be two D810 followup models, one with the 20mp D5 sensor and one with a new 50mp+ sensor), they’ll do just fine. Nikon announced two new action cameras to its lineup, the KeyMission 170 and KeyMission 80. The numbers indicate the field of view (170° and 80°). All three KeyMission cameras (including the previously announced 360) will be available in October. Pricing is US$280 for the 80, US$400 for the 170, and US$500 for the 360. 360 — 360° video in 2160P/24, or 1080P/24. Two f/2 lenses sit on opposite sides of the camera with 20mp 1/2.3” sensors behind each one. This produces 30mp in-camera stitched stills. Waterproof to 98’ and shockproof to 6.6’. Connects to mobile devices with SnapBridge 360/170 app. Uses EN-EL12 battery and microSD card. An odd set of accessories come with it, including a cardboard style VR type of viewer that utilizes you smartphone. 170 — 170° video in 2160P/30, 1080P/120/60, with 1080P having electronic image stabilization. GoPro style casing, but without a housing waterproof to 33’, shockproof to 6.6’. Has a small rear 1.5” 345k dot LCD. Uses the EN-EL12 battery and microSD card. Uses an 8.3mp 1/2.3” sensor, 15mm equivalent f/2.8 lens. 80 — 80° with a rear facing 25mm f/2 lens behind a 12mp 1/2.3” sensor and a front-facing 5mp 1/5” sensor with a 22mm f/2.2 lens. Waterproof to 3.2’, shockproof to 6’. A 1.75” touch LCD is used to compose and review images, and to change settings. Uses built-in rechargeable battery and microSD cards. Frankly, I’m at a bit of a loss to explain KeyMission. Every one of the models has some odd choices and liabilities, and it seems that Nikon is going to leave “mounting” to various things that screw into 1/4” tripod sockets. The 360, for instance, is a 24 fps only device with no IS, which limits its usefulness. The 170 has only electronic IS, but not at 4K. The 80 is designed like a smartphone, only without much smarts and no phone. I’m not sure why I’d want to carry it over my smartphone at all. Of the three, the 170 is probably the most interesting, as it’s basically a GoPro without the need for a case to go underwater, plus it has somewhat better setting and handling. Nikon’s one of the last of the companies to the action cam market, but it doesn’t really seem to show in the product definitions. That’s particularly true in the way Nikon didn’t note how GoPro standardized mounting capabilities in a unique and useful way. Instead, we’re going to be screwing things into tripod sockets all the time with this camera, and Nikon should know that this isn’t going to stand up to action abuse. First knock and you’re camera is no longer lined up where you had it. I really have to wonder if Nikon really talked to action enthusiasts to find out how those GoPros are really being used. If they did, I’m not sure they heard what those folk said. I’m hoping that Nikon is eeking more image quality out of these small sensors than the others have been getting. I’m a little tired of blown GoPro skies, for example. Still, this is going to be a tough sell for Nikon, I think, regardless of what manages to come out of them. Another curiosity is that NikonUSA is promoting a free US$150 value accessory pack if you pre-order the 360 or 170 camera. You’ll get a small case, a small tripod, an extension arm, and an extra battery. That seems like an admission that Nikon is late and overpriced to the market. Sadly, that’s all Nikon announced today. While it was no longer a surprise due a lot of leaking recently, Fujifilm pulled the second rabbit out of the hat today (the Sony A99II being the first) with their announcement of the GFX 50mp medium format mirrorless camera. It’ll disappoint a few that the GFX isn’t going to be available until 2017—starting to be a common theme among announcements this year—but this isn’t just a camera announcement, it’s a full-fledged system announcement, with six lenses detailed for arrival in 2017. Cost for the camera along with the 63mm standard prime lens will be “well under US$10,000,” which means that Fujifilm has decided to give Hasselblad and Pentax a run for their money with the Sony 50mp sensor. Let’s start with the camera. The design is reminiscent of a “larger” XT-2, though the EVF at top is a clip-on. An accessory allows the EVF to be tilted to almost any angle. The sensor is some variation on the Sony 43.8 x 32.9mm, 51.4mp sensor we’ve seen in other cameras, though Fujifilm claims new development of some sort. Curiously, I didn’t hear mention of whether the camera will be Bayer or X-Trans. X-Trans would explain “new development." 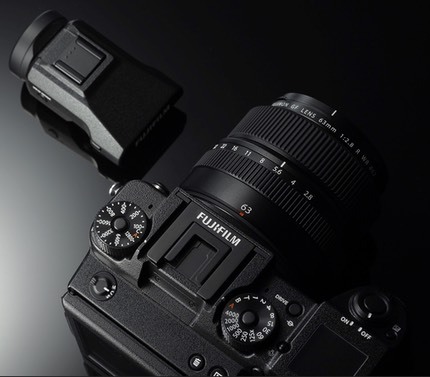 That big sensor provides a 0.79x crop compared to traditional 35mm film, though Fujifilm is emphasizing that the GFX is a “multi-aspect” camera (for example, it can shoot 1:1 images at over 30mp, and it can shoot 4:3, 3:2, 4:5, 6:7, and 6:17 in camera). Shutter speeds extend to 1/4000. The lenses are all designed to resolve “over 100mp.” Take that for whatever it’s worth. By all appearances, Fujifilm has taken their experience with the crop sensor X cameras and applied it directly to a medium format design with as little alteration as possible. 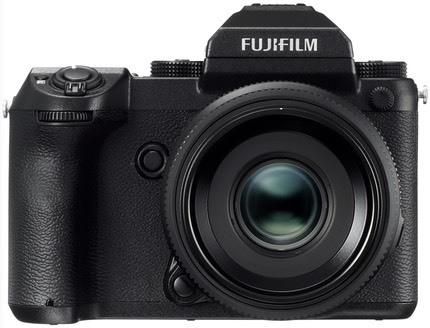 This is going to box in the high-resolution full frame DSLRs, I suspect, as one would expect this new Fujifilm to be a body perfectly suited to landscape and studio shooting, which is where those high-resolution bodies are most coveted. Still, the bigger the sensor, the bigger the cost, and it’s not a linear amount bigger, but exponential. Thus, investing in a Fujifilm medium format kit is going to put you significantly into the five digit game (e.g. >10k). Still, I know wedding and studio shooters that want that Fujifilm color and look, and this camera is going to have instant appeal there. The camera Olympus announced is what I call the PL-Late (E-PL8). A ho-hum update of the PL series that managed to look more ho-hum due to the delay in getting it out after the quake stole its sensors. Like Panasonic, Olympus made much more significant future release announcements, the biggest of which is the upcoming (this year) 20mp E-M1 Mark II. As usual, Olympus is throwing tech at their flagship, this time with a completely new and improved AF system (still has on-sensor phase detection, though different and better). Probably the biggest eye-opener is 18fps shooting with focus, 60 fps without. Olympus claims to have doubled the buffer capacity over the predecessor. Moreover, the camera is “shooting” even when you’re not, as it retains the last 14 possible shots before you pressed the shutter release. And yes, it has 4K video, though not a lot of details were given on this at the press conference. Along with the E-M1 Mark II Olympus announced two new pro lenses and an interesting macro lens. On the pro lens side we get the 25mm f/1.2 and 12-100mm f/4. The macro is the 30mm f/3.5, which manages to break the 1:1 barrier. A new pro service with next day delivery of a replacement unit was also announced. Sigma announced three new lenses, the 12-24mm f/4 Art, the 85mm f/1.4 Art, and the 500mm f/4 OS Sport. All of these are in some form replacements for earlier Sigma lenses. The 12-24mm f/4 DG HSM Art is a redesign of Sigma’s full frame ultra wide zoom. It will be available in late October for US$1599, and in Canon EF, Nikon F, and Sigma SLR mounts. The 85mm f/1.4 DG HSM Art is designed to support high-resolution DSLRs, and like the other lenses, has a re-engineered HSM focus system that focuses faster. It will be available in late October for US$1199 with the same mount support. Finally, the 500mm f/4 DG OS HSM Sport is a significant redesign of an older Sigma classic (500mm f/4.5) that was popular as the budget long lens solution. Sigma seems to be trying to keep up with Nikon on this one, with a much lighter design, weatherproofing, and a two-mode optical stabilization. It will be available in late November for US$5999, again in the same mounts. You might want to get in the pre-order line for this lens, as I suspect it prove to be popular enough to sell out in its first shipment. All these lenses now feature electronic apertures on the Nikon F mount, and can be updated or optimized using the optional Sigma USB Dock. Nikon’s just announced Mission 170 ran head on into the GoPro HERO5 within hours of announcement. But first, let me drone on for a moment. I’m not sure how much meat is still on the bone in both the action camera and the aerial drone market, but sure enough GoPro is trying to find out. They announced the Karma drone (US$799). I see three things GoPro did right: folding arms to keep the unit highly portable during transport, a dedicated controller that’s small and folds up for transport, and a stabilizer system that can be dismounted from the drone and used with a hand grip. Other than that I’m not seeing something that tempts me over the DJI offerings, though GoPro’s pricing is aggressive. They’ll get some customers with this new offering, the question is how many. It’s not exactly pretty, but in many ways it looks like it’ll hold up well, despite the low price point. Along with the Karma, GoPro announced the HERO5 Black, the latest in their series of action cameras. Curiously, the specs read almost the same as the Nikon KeyMission 170, and the pricing is near identical, too. 4K at 30 fps, 1080P at 120 fps, 12mp stills (up to 30 fps burst, plus time-lapse), all centered around a 1/2.3” sensor. Like the KeyMission, the new HERO5 Black doesn’t require a case to go underwater (up to 33 feet, 10m), includes a rear LCD to control the camera, and has built-in Wi-Fi and Bluetooth. Three things stood out in GoPro’s announcement: voice control, auto-upload to cloud (if you’ve got a GoPro subscription), and location capture. Oh, a fourth: raw files for stills. Nikon’s got its hands full: they launched KeyMission 170 right into the powerhouse updating their product in ways that go beyond Nikon, and in a market that’s saturated and full of GoPro endcaps and dedicated displays at dealers and Big Box stores. I had to go back and look at the tech specs on Nikon’s site to make sure I wasn’t missing something: no voice control, no GPS, and no raw still files. The “auto upload” thing is debatable and depends a bit on what the SnapBridge app for the KeyMission cameras does. 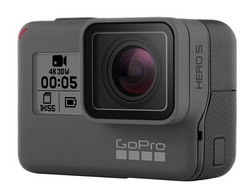 GoPro also announced a new HERO5 version of their smaller and simpler US$299 Session camera, as well.